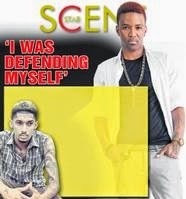 Konshens, known for the song Do Sumn, and the producer were involved in a dispute at Southdale Plaza near Half-Way Tree, St Andrew, sometime after 1 a.m. yesterday morning. Konshens had to seek medical attention at the Andrews Memorial Hospital after the incident. When THE STAR spoke to K Swizz yesterday he gave his version of the incident which stemmed from issues with the song, Stab You In The Back. "A member of his entourage came over to me and said the boss want to talk to you. I am not thinking anything negative so I went over there. The first thing he said was I tell you do not release the song. I told him I didn't know what he was talking about," K Swizz said. K Swizz said that a person from his camp wanted to release the song but he told the individual not to release it. He said because his connection with Konshens was severed he would not have had anything to do with that song. Yesterday morning, according to K Swiss, when he went to the artiste, he noticed that the artiste put down his drink and that he put his arm around him and began squeezing his neck with force. "I retaliated in self-defence. When I retaliated I swung, he got hit in the face and his entourage ran down on me and a heap of kicks left, right and centre, all over. I am not in this for any glory I just want the public to know that I was defending myself. I am not in the business to cause problem," he said. As a result of the incident, the artiste was injured above one of his eyes. In a lengthy broadcast message yesterday, allegedly sent out by Konshens via WhatsApp, he also sought to clarify the situation. According to the message, Konshens was accidentally hit over his eye with a bottle. The message stated that the producer made a misjudgement, misunderstood the situation and acted out of fear. It further stated; "...He felt threatened and made a decision to swing and run. Upon running he was accosted by persons from the crowd, there was no intent to hurt him. People see Konshens with blood on his face and see you running it will be dangerous for youÉ and I'm sure people on the scene can attest to seeing me with my bloody face pulling people off of him even before I left." Konshens also apologised to the proprietors of the venue where the event took place. The Half-Way Tree police are aware of the incident.